Volunteer Sophie Robbins, a resident of Bridgewater, with Matheny community resident Josh Handler. 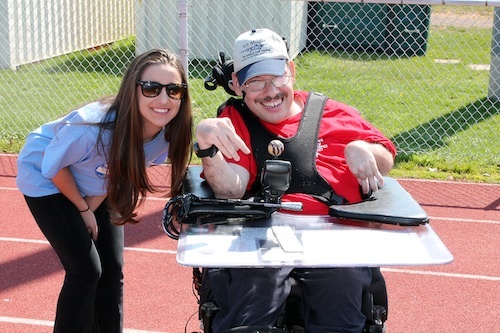 Matheny students, patients and group home residents brought home a total of 44 medals from the Somerset County Special Olympics, held Saturday, May 3, at Bridgewater-Raritan High School in Bridgewater, NJ. 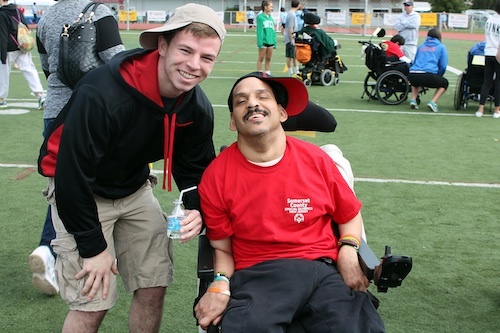 Participation in Special Olympics is an important part of Matheny’s recreation therapy program, which provides a range of recreation choices to improve physical, emotional, cognitive and social well-being. Students, patients and community residents are encouraged to take part in several adaptive sports teams throughout the year, including track and field, adaptive karate and power wheelchair soccer. Volunteer Taylor Black of Franklin Twp. with Matheny community resident Alex Martinez. This entry was posted in Uncategorized and tagged Somerset County Special Olympics. Bookmark the permalink.